Last weekend’s farmer’s market brought the sad news that the annual tart cherry crop I depend on was hit by hail at the blossom stage, and the crop was lost. I nearly had a full on anxiety attack. Life without tart cherries? Tart cherries are – maybe – my favorite food on earth. And every summer, I can 8 quarts of sour cherry pie filling and 12 pints of tart cherry jam. The one that didn’t gel, as I lamented in my post on apple pectin. My cherry pie is anticipated at Thanksgiving’s Dead Poultry Society party. Don’t worry. I’ve located some cherries. Once again, food52 connections came through – there will be a Canorama in Pennsylvania next month, with a world of cherries ready to be canned. 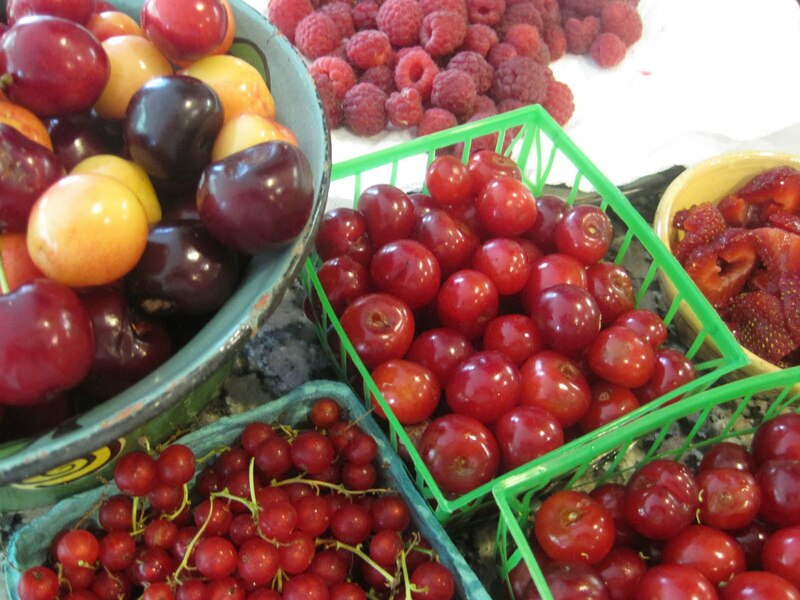 In the meantime, when I saw first of the season sweet cherries last week, I brought home deep red, nearly maroon, super sweet, velvety cherries, bright red slightly tart cherries and Emperor Francis, a yellow heirloom beauty, streaked with pink that straddles tart and sweet with rare perfection. The next day, I spied two pints of tart cherries (Montmorency) at another market. I had the weight for jam, but not the recipe. After consulting several canning books, I came right back to Christine Ferber, of course. She has a half sweet and half tart cherry preserves, flavored with Kirsch. As I am not a big fan of Kirsch, and I am a big fan of herbal tones in jam, I turned to my favorite cocktail enhancer, St. Germain. Elderflower liqueur. So French! AND — drumroll please — I used my new apple pectin. And it worked. Perfectly. This preserves has a very nice gel that’s soft set, with the whole cherries suspended in the gel. It’s beautiful in the jar, on the spoon, on top of homemade ricotta, stirred into yogurt, spooned over ice cream or pound cake. If you don’t have apple pectin, substitute one package of commercial pectin and follow the directions on the box for finishing the preserves. Oh, did I mention my beautiful new copper preserving pan? I love it. Yes, it really does make a difference. 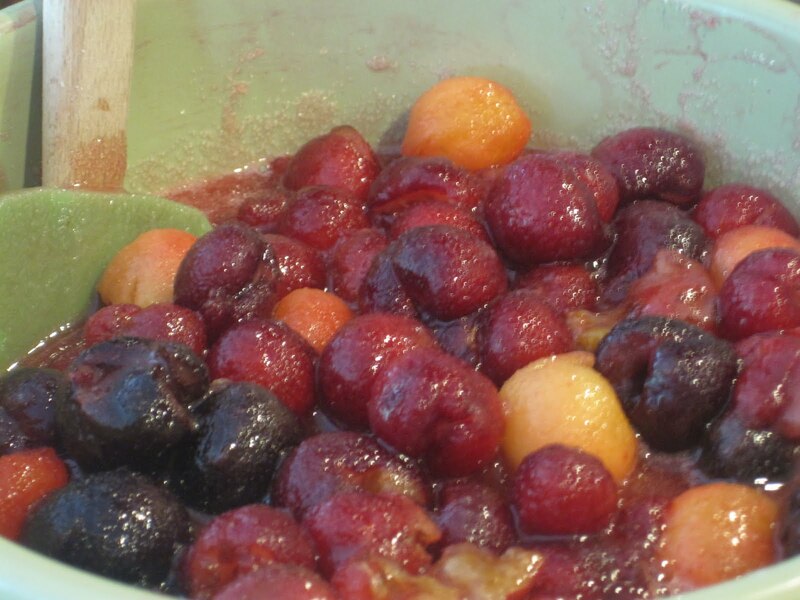 Pit the cherries over a bowl, capturing all the juices. * Add the sugar and lemon juice and allow the mixture to sit for an hour. 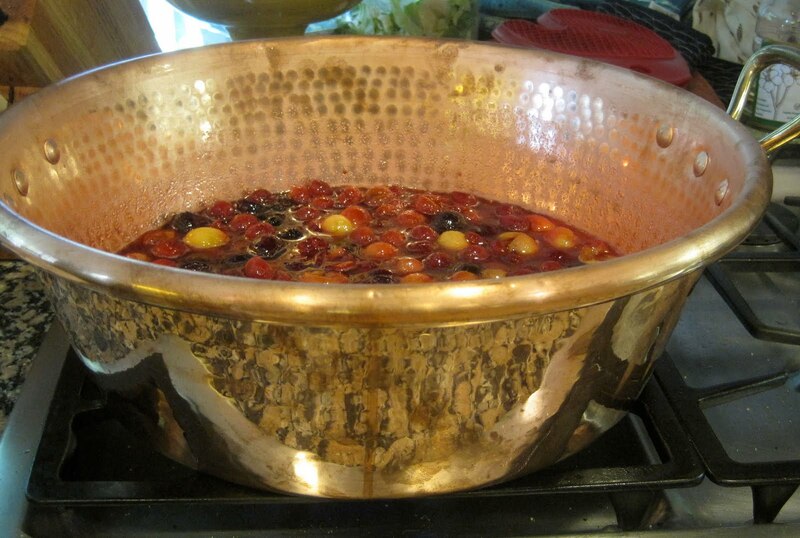 In a preserving or other wide and deep pan bring the mixture to a simmer. 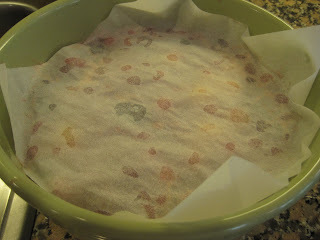 Remove from the heat and pour the jam into a glass or ceramic bowl, cover with parchment and allow to develop overnight. Allow the syrup to boil for 5 minutes and skim the foam as completely as possible. Add in the fruit, bring the preserves back up to a boil, then add 2-5oz packages of apple pectin and the butter. Butter added at this point will break down any remaining foam. Bring back to a boil for one minute, test the set. 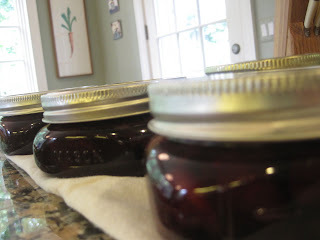 Once the preserves forms a jelly, turn off the heat, add the liqueur, stir well, and allow the preserves to rest for five minutes. This will keep the fruit from floating to the top of your jars. Fill half-pint jars, leaving 1/2″ headspace. Seal with lids and rings. Process in a boiling water bath for 10 minutes. Remove to a towel on the counter and allow to sit, undisturbed, for 24 hours. The preserves will further set up during the resting period. *I have never used a cherry pitter, but I’ve only canned tart cherries, the ones that need only the thumbnail to pluck the pit out. The sweet cherries are a whole different beast. Now, I’m in the market for a cherry pitter. Anyone have a favorite? Absolutely Gorgeous! 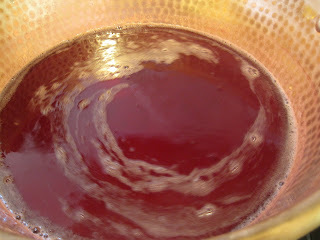 I just canned some Cherry Pinot Grigio myself–I shall have to blog aobut it too! OMG I have to make this – only one package of commercial pectin? I am a cherry freak myself… Will tweet a photo of my cherry pitter, purchased long ago at Williams Sonoma. Really works! Glad you like the recipe! Based on the weight of the fruit, I'm assuming one package of commercial pectin, but please! check the package directions. And check the set using a cold plate. You can always add more pectin. I bought one years ago at Wms Sonoma, it's Westmark Kernex, made in Germany. Works great. 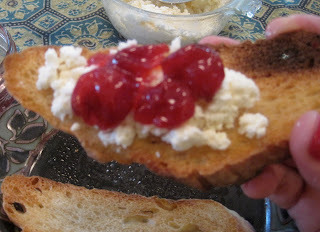 Thank you for the recipe, I've got a bumper crop of cherries this year and was thinking about jam. This looks lovely. I just plopped all my pitted Washington cherries into bourbon. Gonna let is marinate for a couple months. Love cherries!